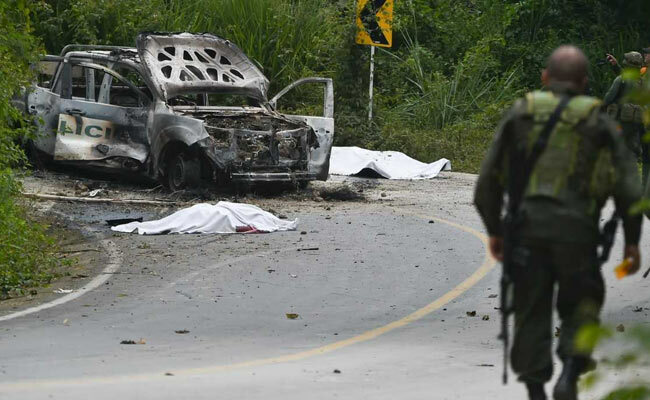 The officers were near the town of Caldono, in southwestern Colombia, when their vehicle was "attacked with an explosive," the police said in a statement. Caldono, Colombia: Two Colombian police officers were killed Saturday when criminals bombed their car, then hurled grenades and strafed it with gunfire, local authorities said. Officers Jorge Andres Quintero, 31, and Jhoan Sebastian Rodriguez, 25, were on their way to pick up a man detained at a nearby police station. The statement added that guerrillas formerly with the FARC rebel group are active in the area, but did not directly assign blame. Cauca police commander Colonel Edgar Orlando Rodriguez said at a press conference said that after the bombing the car was hit by "rifles bursts and fragmentation grenades." President Juan Manuel Santos condemned the "cowardly murder" of the officers on Twitter, and vowed that "those responsible will pay." The 2016 peace deal between the Santos government and FARC led to the disarming of nearly 7,000 fighters. The ex-guerrillas became a political party using the same acronym. However some 1,100 rebels refused to join the peace deal. The dissidents are primarily involved in drug trafficking and illegal mining, officials say. Colombian authorities remain up against criminal organizations, drug cartels with paramilitary links, and the National Liberation Army (ELN), the country's last active guerilla group.